Description: one of my favorite locations to shoot from. Description: As quite a surprise I saw this train with BNSF Power sporting 4 versions of BNSF Paint Schemes. Description: Great to see one of these 20 Cylinder Beasts still on the rails! 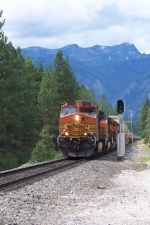 Description: An eastbound intermodal decends the 1.8% grade down from Winton and into the upper Leavenworth Valley. 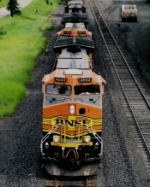 Description: BNSF mixed freight leaving Old Monroe. Taken at Twin Rivers Rd Crossing.